Correct posture prevents fatigue and promotes efficiency. Adjust the chair according to your height. Do not sit all the way back in the chair, but sit somewhat forward so you are occupying approximately 2/3 of the chair seat. Sit slightly left of the table center so that your right eye and the needle bar are aligned. 1. Raise the presser foot by pressing the presser foot treadle. 2. Position the fabric in place, and then fix the fabric with the presser foot. 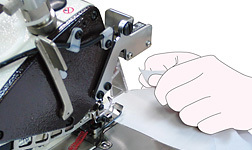 If the fabric edge is curled, uncurl the fabric edge with the index finger of the right hand. 3. 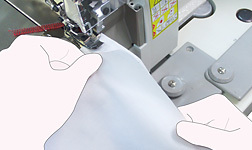 Sew the fabric as long as you can, by pressing the machine treadle. 4. Change the way to hold the fabric. Hold the fabric from the top with your left hand. 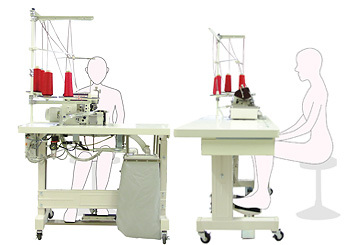 At that time, the left hand should be placed at the position where the end of sewing will be. In addition, the place should be on the inward side from the right hand end (the width should be kept the same width as the presser foot). Place the right hand along the underside of the fabric. 5. Sew the fabric at once till the end of sewing. Do not pull the fabric during sewing. Sew the fabric straightly while taking up the slack. Be sure to handle the fabric with the right hand. 6. When employing an overedger, your eye line should be fixed at the knife cutting place (the cut allowance should be equal, at 3 mm to 5 mm. Position the first piece of the fabric in place, and then fix the fabric with the presser foot. 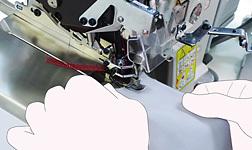 Align the second piece of the fabric with the first piece of the fabric correctly by handling the bottom fabric with the back of the middle finger of the left hand and that of the ring finger, and the index and middle fingers of the right hand. 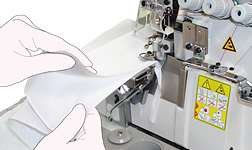 Check to make sure that the two pieces of the fabric are laid accurately on top of each other. When the second piece of the fabric is aligned with the first piece of the fabric correctly, sew the two pieces of the fabric 1 cm to 2 cm first.